For the latest course information spring 2019 (schedule, literature and more) see courses further down. For all general study-related questions concerning courses, contact Study Counselor at susdev@geo.uu.se. For other questions concerning CEMUS Education contact Director of Studies Alexis Engström at alexis.engstrom@cemus.uu.se. Den här kursen vänder sig till studenter som läst Hållbar utveckling A vid CEMUS eller motsvarande kurser vid annan institution. Kursen består av fem obligatoriska delkurser: Förändringsprocesser – ledarskap, kommunikation och organisation 6 hp, Tvärvetenskapliga och historiska perspektiv på värderingar, världsbilder och visioner 6 hp, Ekologiska, ekonomiska, sociala och kulturella perspektiv på teknik 6 hp, Livsfilosofiska perspektiv på individ, samhälle, miljö och utveckling 6 hp, samt B-uppsats 6 hp. Do you want do a sustainability project, reach others and change the world? Then this is a course for you! This course gives you an introduction to project management models for working with sustainable development that combine different practical and creative tools in planning, implementation, communication and evaluation. The course is designed for students that independently want to plan and implement a project idea that contributes to a sustainable development. Students are employed by CEMUS as course coordinators. They plan, run, and evaluate university courses at the undergraduate and graduete level. The syllabus and learning outcomes are developed and solidified through a collaborative process involving students and university staff. Based on this, course coordinators plan the general structure of the course, create a reading list, invite guest lecturers, lead seminars, and handle course administration. Partnered coordinators are often selected from different academic backgrounds and tend to work on a course that they have both previously taken. 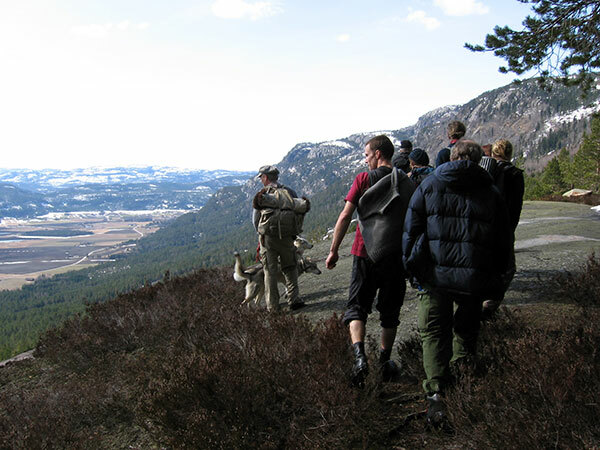 A reference group is formed for each course. It consists of researchers, teachers, and often practitioners from fields relevant to the course. Working closely with course coordinators, this group suggests literature and possible lecturers and gives feedback on the proposed course structure and schedule. The work group is also responsible for examination. A lecture series is the backbone of CEMUS courses. Course coordinators invite the most knowledgable and intresting practitioners and academics from different fields, often from other universities and sometimes from other countries, to give guest lectures and facilitate discussions. The educational management team provides administrative, pedagogical, and practical support to the course coordinators in their daily work while overseeing the long-term development of CEMUS. 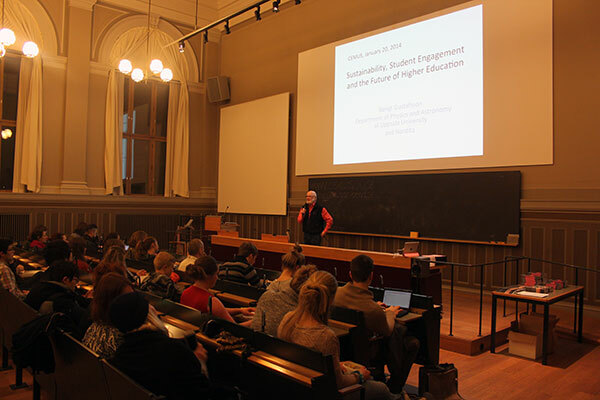 The group includes the CEMUS and CSD Uppsala Director of Studies and CEMUS Educational Coordinators, which all have a background and experience of student led education at CEMUS. Is a pedagogical project by Malin Östman at CEMUS, with funding from the Pedagogical Renewal Fund at the Faculty of Science and Technology. 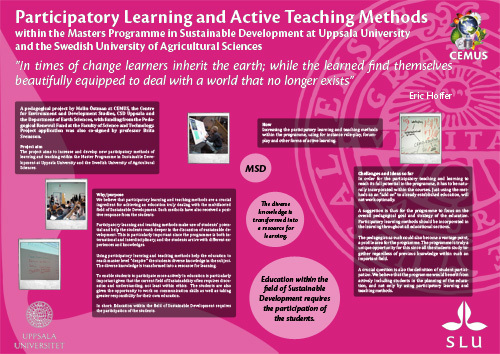 The project aims to increase and develop new participatory methods of learning and teaching within the Master Programme in Sustainable Development at Uppsala University and SLU. Learn more by clicking the poster below.